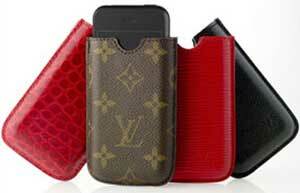 After all that anticipation and hype over the iPhone, Designer Company Louis Vuitton introduced this week the specially designed LV case for apple iPhone. Although I don’t see anything special about these cases, others may disagree. It’s an accessory that’s going to sell at 75 KD (nearly 250 USD) for the monogram pattern and up to 350 KD (1250USD) for the alligator version (First one on the left). It is ridiculously expensive for an accessory that is used for one phone brand. Not for Paris Hilton 😛 or the filthy rich who can afford it ! That’s too much for a case, I would never buy one. I think it will sell like hot cake in Q8 ! People got money to burn you know ! Hot cakes? I don’t think so. Apple iPhone is not officialy available here, and I doubt the fanboys who will buy an iPhone will get this. Now if this was for Nokia, that’s a different matter! the case cost almost half the price of the phone! if there will be iPhone here in Kuwait then I think Grey will be exactly right, it will sell like hot cake here since q8 people’s mentality is really weird! Same here.. too much for a case that only fits 1 phone .. I don’t think so, but what if sells .. Now, that wil show how materialistic people can be. You don’t pay that hefty price tag for the bag… It’s for the name which I found quite stupid. I don’t think it will be a huge sensation.. unless as ‘Carlsb3rg’ mentioned decided for a Nokia version.. which will be interesting to see how Kuwait will respond..